Fastbind’s C400 manual creaser is optimized for Fastbind Hot Melt Perfect Binders. The C400 makes the crease using a precision creasing bar. Special step-shape guides enable you to make up to four creases without readjustment. 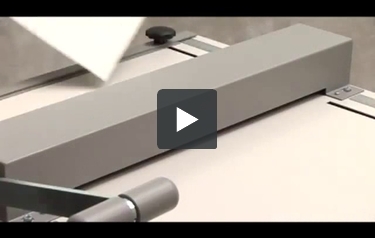 The C400’s versatility and consistent pressure guarantee a sharp regular crease in card, paper, PVC coated cardboard, and numerous other materials. The development of low-cost desktop publishing software and digital printing technologies has led to the progress of self and e-publishing. Many self-published books utilize printing techniques which are chosen for their suitability for short press runs. In some cases, books are printed on demand with no inventory kept. Small companies also need publishing capabilities for numerous applications. Our Fastbind Perfect Binders can bind those soft cover books either on-demand or for small series. The results reach or exceed the quality of traditional soft cover books found in bookstores. Two Alignment Guides. Fastbind’s C400 is specially designed to crease soft book covers for perfect binding, spread prints for Fotomount binding and cards for on-demand publishing. With two alignment guides, you can make two different setups, for example, to fold a letter-size sheet along three lines, or the make the standard four creases for soft book covers. Adjustable Creasing Power.Although manually operated, you can adjust the C400 to consistently give a deeper or shallower crease using the adjusters located under the creasing bar. Max Creasing Width: 400 mm / 15.75"
Machine Dimensions (W x D x H): 590 x 690 x 170 mm / 23.2 x 27.2 x 6.7"
Box Dimensions (W x D x H): 610 x 600 x 130 mm / 21.3 x 24.0 x 5.0"
Need of Table Space: 540 x 610 mm / 21.3 x 24.0"
This is the Fastbind C400 Manual Creaser! We’re going to show how to make a soft cover. Start off by adjusting the back stop to the appropriate length for you project. Then slip your project in,and place it against the guide. You’ll notice two edges on this guide. Making a crease with the cover’s edge against both of these respectively creates spacing for your cover’s spine. When you finish with both, fold them at the creases and you can see the start of your own soft cover book! 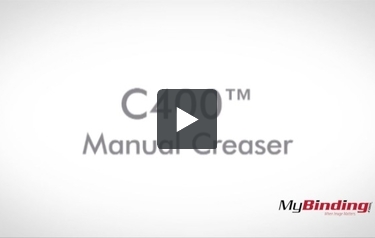 C400 Manual Creaser. Creasing soft cover. Fastbind.